I’ve said several times now that 2015 was a bad writing year for me, and by all my usual measures, it was probably my worst year since I started publishing professionally. I sold only a few stories, finished probably even fewer than I sold, and wrote almost no fiction over the last half of the year. But looking back, I realize that even my rough writing year wasn’t as bad as I first thought. Funny how that happens—indeed, we are worst critics. So what good, writerly things did happen for me in 2015? I made five sales, although three were reprints. I sold every story I submitted in 2015, including “Last Night at the Café Renaissance” to Intergalactic Medicine Show, a quality pro-rate market. This happens to be one of my favorite stories, too. I had quite a few stories appear both in print and online, including one that had been sitting in the publishing queue at Space and Time magazine since 2012 (“From the Darkness Beneath”). 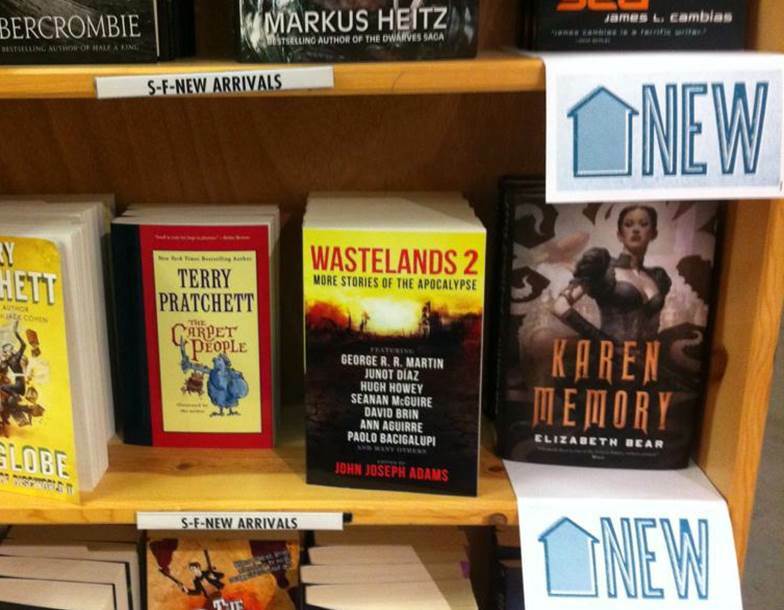 I had a story come out in a major anthology (Wasteland 2—that’s it on the shelf next to Terry Pratchett in Portland’s Powell’s Books! ), where I shared the table of contents with folks like George R.R. Martin, Cory Doctrow, Bruce Sterling, Nancy Kress, and Seanan McGuire (not bad company). I also had stories come out in two small press anthology’s (In the Trenches: The Psychological Impacts of War and Coven). I garnered a few nice reviews for the stories I did sell, and “Last Night at the Café Renaissance” landed on Tangent’s Recommended Reading List for 2015. It’s my fourth story to land such an honor from on the major science fiction review magazines. I finished a novella that I plan to self-publish as the first in a series. I also found a copy editor for it and got the manuscript all spiffed up. All that’s left is commissioning some cover art and getting the layout done (no small tasks, those). While I sold my story “Now and Forever” in 2014, I had to keep it all hush-hush until Simon and Schuster formally announced the What the #@&% Is That? anthology. That one also has a table of contents that puts fanboy swirls in my eyes. And finally, I got interviewed by the magazine produced by the non-profit I work for in my day job (did you follow that?). That might not sound like much, but my non-profit doesn’t produce a small newsletter; it’s actually something sent out the public and people read. Our communications team thought my personal story and “side” career as a published writer would be of interest to those who support our organization. I have to admit, that was kind of cool. Certainly not as bad a year as I thought, but I know deep down that it could have been better. That said, if 2015 turns out to be the worst year of my writing career, then I’ll be in pretty good shape. This entry was posted in Writing and tagged Coven, In the Trenches, InterGalactic Medicine Show, Last Night at the Cafe Renaissance, Now and Forever, Wastelands 2, What the #@&% Is That?. Bookmark the permalink.